I will review the criticisms of dynamite plots, which I generally agree with, but then want to put forward a couple of their advantages, and suggest that the generally favored Tukey box-and-whisker plot is not a universal solution to graphical problems. they hide the raw data — the plot shows only the means and standard errors (or 95% confidence intervals) of the groups. the previous two issues both stem from dynamite plots' strong parametric assumptions about the data. This document by Frank Harrell gives an example where a dynamite plot conceals strong bimodality (the existence of "responders" and "non-responders" within a single treatment group). Should plots be anchored at zero? If the differences among group means, and/or the standard errors/confidence interval ranges, are small relative to the absolute magnitudes of the responses (e.g. means of two groups equal to 10 $\pm$ 0.01, 10.05 $\pm$ 0.02) it becomes very hard to see the differences. (If the point you want to make is that the results are statistically significant but very small in magnitude, perhaps this is a good thing …) In my opinion, if the data are not naturally anchored at zero (e.g. data shown on a logarithmic scale, or data in a very small range) then dynamite plots just don't make sense. Would you prefer to display the structure of the data, or the structure of statistical inferences on the data? 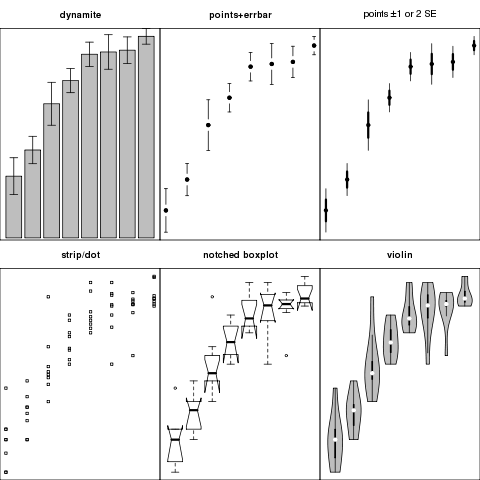 The advantage of the generally recommended dot plot (for small data sets), boxplot (for medium data sets), or violin plot (for large data sets), is that they show what's going on in the data. However, they don't show anything about the confidence intervals on the mean (for example), although notched box plots (McGill et al. 1978: see figure above) give an approximate indication of significantly different medians. Do you want your plot to match the structure of the statistical test(s) you carried out? Standard ANOVA, for example, assumes normal errors with equal variances across groups. In that case, you presumably already did the exploratory data analysis (including graphing) to confirm these assumptions are reasonable. The assumptions of the dynamite plot (symmetric confidence intervals, reasonable distribution of points within groups) match the assumptions of your analysis. On the other hand, maybe you should show the data in the exploratory (dot/box/violin) format so that your readers can assess the validity of the assumptions for themselves rather than taking your word for it … or at least show the per-group standard errors rather than the pooled estimate of the standard error (as is done in the figure above). This problem gets even harder for complex statistical designs. How do you represent (for example) spatial dependencies in the data in a plot of the means? I used the OrchardSprays data set from R (originally from Finney 1947, by way of McNeil 1977), which is used as an example in the stripchart documentation. the first row shows more "inferential" plots (based on means and standard errors), the second shows descriptive or exploratory plots; in the third plot, I tried to add more information by mimicking the Bayesian posterior plots from Gelman and Hill's book or their arm package for R. Their plots show the 50% and 95% (I think) credible intervals for each group; I show $\pm$ 1 and 2 standard errors (could also do this with 50% and 95% frequentist confidence intervals based on the t distribution). these plots are all done in base R graphics (with the help of the vioplot and gplots packages from CRAN). They could all be done, with more or less effort, in lattice graphics instead. See also: this blog post comparing box & violin plots. Excellent book. Thank you for publishing it. An alternative to above is the beanplot which I have found useful for comparing posteriors from Bayesian analyses. They are similar to the raindrop plots described by Barrowman and Myers (2001) but is contained in a nice R-package. I prefer them to violin or box plots since bimodality can be hidden with those approaches. I hope you find this useful to the debate. Barrowman, N.J. and R.A. Myers. A new graphical display for meta-analysis: the Raindrop Plot. Am. Stat. I'm not sure how a box-percentile plot is different from a violin plot. Am I missing something? So nice to get a non-spam comment! A box-percentile plot uses the empirical cumulative distribution function, the violin plot uses the kernel density estimate (so, basically a smoother version of the box-percentile plot). What you talk about is base boxplot. Do you think it will be better to some words on notched boxplot and violin boxplot? 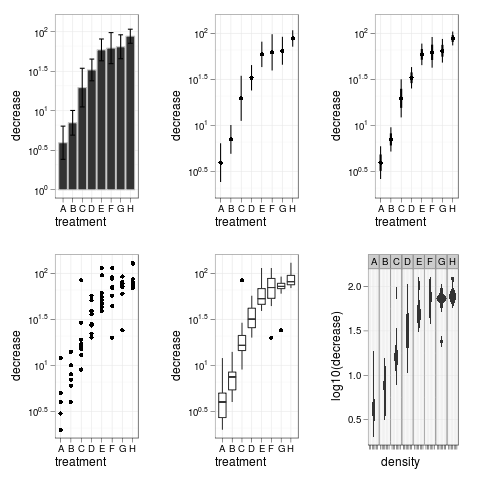 I discuss notched boxplots above; ggplot2 doesn't have such an option at present (I think). I also discuss violin plots — I don't know of something specifically called a "violin boxplot". Can you say more specifically what you were looking for? 1. the data-to-ink ratio is a general criterion put forward by Edward Tufte, probably the best-known statistical graphics expert, which says that one goal of statistical graphics is to represent as much information as possible with as few lines ("ink") as possible. Tufte also likes high data density.